Carmen (Katharine Goeldner) seduces the boys as only a girl can. 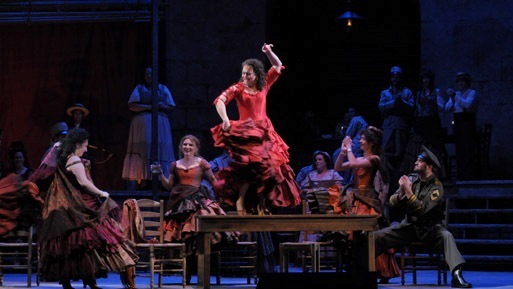 When Carmen, as embodied by mezzo-soprano Katharine Goeldner in the Lyric Opera’s production of Georges Bizet’s opera, sang this line (or something very much like it, and in French, natch), I knew I’d found my operatic heroine. Carmen is one sassy dame: she knows what she wants, and how to get it. She lives and loves for the moment. Everything is by her own terms, thankyouverymuch. So, in looking for that weekend man, she tosses a flower, plucked from her bosom, at Don José (Yonghoon Lee), which poisons him with passion and ultimately leads to their mutual grand demise. At 3.5 hours and 4 acts, this certainly is one epic love story. I’d be lying if I said my mind didn’t wander during the somber third act. Yawn. But act four comes complete with a parade (seriously, either I was hallucinating, or there were at least a hundred people on the Lyric’s stage at one point), and then the dramatic final curtain. ¡Olé! The problem was, Goeldner — a last-minute replacement for Kate Aldrich who’s apparently suffering through pregnancy pains — failed to radiate magnetism or danger or fire or anything I’d consider Carmen-esque. She was more “party girl Carmen.” Which is a valid interpretation, but it didn’t work for me. And from the middle orchestra, she looked a lot like West End musical theatre diva Maria Friedman in the face. Which I guess is my polite way of saying I’m not quite sure why Don José would drive himself mad trying to win her favors. But she sang with gusto and had all the moves down (mostly … she needs a bit more time with those castanets). Goeldner plays the role through October, and is replaced by Nadia Krasteva during the March run. Lee made an impressive Don José, hitting the high notes with power. He clearly was an audience favorite. As his wallflower girl crush (essentially, the antithesis of Carmen), Micaëla, Elaine Alvarez possesses a really lovely soprano, and does the vulnerable thing very well. And that Bizet score has those instantly recognizable numbers in it, including the famous Habanera (which Bizet apparently plagiarized?) and the toe-tapping Toreador Song. Scenic designer Robin Don has set the thing in what appears to be a bull fighting ring, or an arena of some sort. Intriguing, but a bit dull to look at after a while.